Chaos theory and merlot chocolate cake? A wine vlog about Vineyard Terroir and the chaos of winemaking. The vlog takes an unexpected turn when the preparations of a Merlot Chocolate Cake becomes slightly chaotic. Find out more about wine terroir, and enjoy the presentation! NOOOOOOOOOO! My beautiful cake! I better rewind that and explain to you you guys what’s going on. Hey Tasters! Today is November 7th and my wine calendar tells me it’s International Merlot Day, any excuse to have my girlfriend’s over. You’ve heard about tea parties, garden parties, coffee and cake, we’re going to have Merlot and cake but for that to happen I have to bake a cake. A merlot chocolate cake. I’ve discovered it in a favourite blog of mine, and I’ve left a link for you guys in the description below. Let’s bake a cake! This morning in the shower I started thinking about entropy. This idea was introduced to me many many years ago. It’s the idea that the universe gets progressively more and more disorganised. A slow decline into absolute chaos, and I find this thought kind of comforting, because when I look at the state of my bedroom I think to myself you can’t fight this. It’s just what the universe wants. So from the idea of entropy I naturally jumped to chaos theory. Within a chaotic situation there are always self-organising systems and feedback loops, patterns and repetition. What does this have to do with my Merlot chocolate cake? Cake making is chaotic, or at least it is the way I bake cakes. Eggshells into the batter and then have to fish them out. However, it all comes together in the end and the beautiful cake emerges. Let’s take a look at this in action. Let me demonstrate chaos theory and cake making for you. 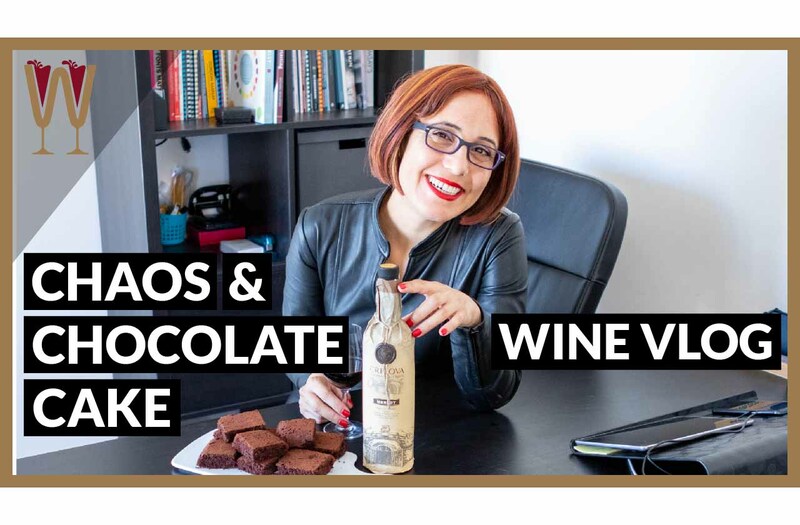 A vlog about Merlot Chocolate Cake? So guys, you’re probably wondering if WineScribble has turned into some kind of baking vlog, and that’s not the case at all, my goodness that would be disastrous. I’ve been thinking and as part of my shower thought about entropy and chaos, I’ve decided to share with you a diagram about how we begin with the chaotic conditions of the vineyard. And how these come together through the skills of the winemaker, and through a bit of good luck, to produce beautiful order. A bottle of wine that is essentially an expression of the chaos that has been tamed. And, that’s what I want to share with you, but I have a party to prepare for as well. So please be patient and enjoy my baking skills. So, this is it. But, let’s see what emerges from the oven. This needs an hour. Alright guys, now I’ve promised you a sketch. Guys, let’s talk about the chaos that is a vineyard. Think of terror as an umbrella term and this umbrella term, terroir, is central to the life of the grape and to the kind of wine the winemaker will produce at the end of the long processes of viticulture and viniculture. Terroir consists of different elements. For example, climate. When we talk about climate we generally refer to three main components. Number one is rain, number two is sunlight and number three the temperature. Another element of terroir is relief, and that generally refers to three things the altitude, the slope and not just the sunlight but the aspect. Another component of terror is geology and this has to do with the soil. We’re specifically interested in two elements about the geology of the vineyard, and before you ask these are rocks, this is water and what we want to know about is what the water supply is like and what the drainage is like. Finally, soil chemistry, and this refers to all the components, the chemical components, and the microorganisms you might find in a vineyard. Acidity, calcium levels. Terroir consists of many different elements, and these are just the main ones. This is absolute chaos not least of all because there are even more elements to terror such as the yeast, pests, diseases, that will alter many of these variables and affect them. Excessive rain, freak weather, you have these variables these elements this complete chaos. And making wine is an attempt to rain the chaos in and to start introducing order. Controlling all these natural variables until you produce something that is artificial. And I don’t mean that in a negative way. An artefact, the product of craftsmanship. You take natural materials, you take a natural situation, and you introduce human artifice, and you begin to control. You end up with a masterpiece, which is what a bottle of wine is. What’s this? Oh my goodness, what was that sound? I think we’ve lost the electricity. Oh, it’s an electric oven guys and the cake is definitely not finished yet. Let’s go have a look. It’s not a fuse, it’s the mains electricity supply. Guys, it’s been 25 minutes the power hasn’t come up yet so this cake is definitely ruined. However, I have an idea that that I think might bring things around. Come with me. Hey tasters! So, that that power cut was really unfortunate. The oven stopped at the worst possible moment, and destroyed my cake. So, we’re back to chaos. But, I have found a way to restore some order. I decided to make the most of a bad situation and turn the cake into brownies. I just had two. What I’m going to do is actually serve them with this side of Merlot spiked cream chocolate. And very very lovely it is too. So, that’s that. Of course, we’re not having this wine tonight. A friend of mine from Moldova has just gifted me bottle of Merlot from Cricova winery, and I will be telling you more about it. If you follow me on instagram please check my feed and my stories, and you will find a lot more information. So my girlfriends and I will be enjoying this very special bottle of Merlot on International Merlot Day. Thank you Yuri and Svetlana, I really appreciate it. So, I’d like to wrap up this story about chaos and taming chaos and I’ve got some notes here because I don’t want to get the names wrong. During the Eagle Creek fire in 2017 in Oregon, the fire raged for more than two months. It reached its peak just as the grapes went into veraison, and the grapes were softening. All the smoke from the wildfires went straight into the grapes. And this caused huge problems for the winemakers, because smoke taint is a flaw. Many winemakers scrapped the vintage all together, refused to make any wine out of it. I was very impressed with one particular winemaker called Michael Garofola who argued that, actually the wildfires and the smoke were part of the terroir. And, in fact, made a rosé and a red wine using the smoked grapes. I respect that. I think that is authentic, facing the chaos squarely and saying what can I do with it? Cheers! Guys, this vlog not entirely intentionally has demonstrated chaos. However, if you’ve enjoyed this discussion of chaos and taming chaos to extract as much order out of it as possible, please give me a thumbs up, subscribe, and I’ll see you next week.